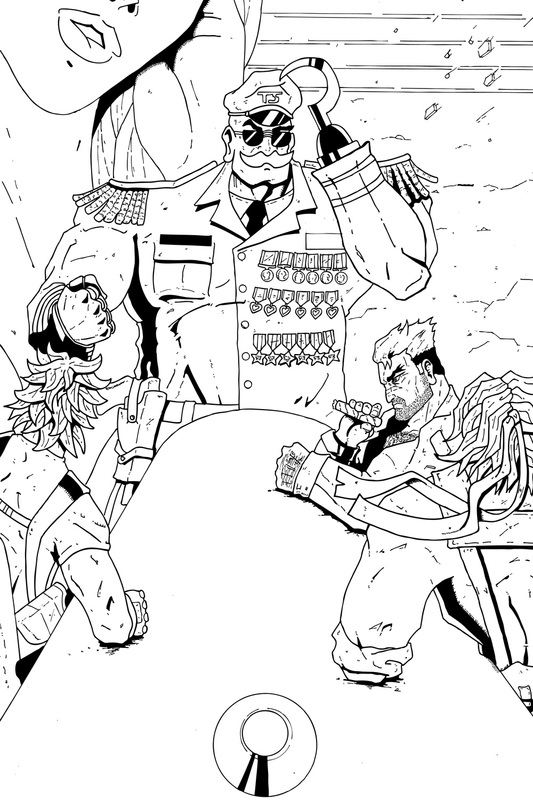 Time to spice up the middle of your week with some Team Stryker action! This was a difficult page to ink due to the fact that the characters in the foreground aren’t the focus of the page. It can be hard to determine what thickness of line to use when the characters in the middle of the page are more important that the ones closest to the reader. I wanted to make Strongbottom the focus so he had to have the thickest, boldest lines to highlight his importance. The other hard decision was how thick do I make the lines of the newscast going on in the background. It’s an extreme close-up but it’s also in the background. Hopefully you all agree that I found a happy medium. One of the benefits to being my own inker is that I get a second chance to add last minute details that I forgot/ignored during the penciling process. Unless you have a really talented inker working for you, when your pencils are done they are done. Me on the other hand, I can go and add more detail, fix mistakes, and add polish before I begin coloring. My pencils are usually pretty detailed before I ink but it’s nice having that wiggle room. I know there are some artists out there that if they are inking their own work they won’t even do finished pencils and save all the detail and polish when they ink. Have a great “hump” day everyone and I will see you back here for a Good Friday Team Stryker treat!